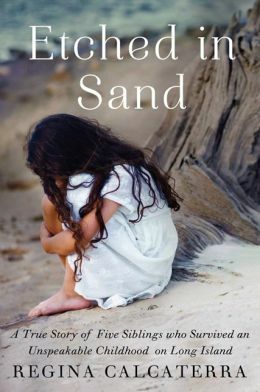 Etched in Sand by Regina Calcaterra is an eye-opening memoir. This story tells of the impoverishment Regina and her four siblings had to endure throughout their childhood in Long Island. Each child has a different father (none of which are in the picture), and their alcoholic mother is both verbally and physically abusive. Leaving the kids on their own for weeks, even months, at a time (to spend time with a new boyfriend or drink herself senseless at a bar), “Cookie’s” kids have never known stability. Regina is tasked with keeping her two younger siblings safe, fed, and sheltered. Sadly, this task is much easier when their mother, Cookie, is away. One night, after Cookie stumbles home from wherever she’s been holed up for the past several months, she decides to take out her aggression on Regina. But this time, the damage is too extensive to hide, and school authorities report it to social services. With the promise of keeping her two younger siblings safe and away from their mother’s grasp, Regina is “tricked” into telling her social worker everything. However, she soon learns that kids like her are often thrown under the bus by the system put in place to keep them safe. Ripped apart from her younger siblings, Regina must learn how to navigate the world on her own (while still struggling to keep her family together). Somehow, through more hardships than most of us can even begin to imagine, she manages to pick herself up and create a good life. This spell bounding account will have you thanking the heavens for everything you have and help to remind you that there is always someone out there worse off than you. I give this heartfelt piece four out of five stars. Echo used to be popular. She had all the right friends, impressive extracurricular activities, the perfect sports star boyfriend. But her entire high school status was changed by the tragic events on one life-shattering night. It wasn’t bad enough that she lost her brother due to the war in Afghanistan, but on top of that she now has hideous scars claiming the skin of her arms and has no idea how they got there. Her body has repressed the memories of what took place that night to keep her fragile mind safe. All she knows is that rumors fly fast in furious in the high school social world and that there is a restraining order in place against her bipolar mother. Like Echo, Noah used to have it all, the right friends, a fierce and promising future in basketball, and a loving family. But after a fire claimed the lives of his parents and the system took his little brothers away, life doesn’t look so hopeful to Noah. Being unjustly bounced from three different foster homes has caused Noah to feel downtrodden and hopeless. To cope, he smokes copious amounts of weed, hangs out with corrupt foster siblings, and screws any girl willing to ride that train for a night. With some manipulation on the part of their new guidance counselor/social worker, Echo gets conned into tutoring Noah. The result? Maybe they aren’t so different after all. Both carry scars (physically and emotionally) and both have lost their families (Noah by a jacked up system, Echo due to an unstable mother and a controlling father who thinks a new wife and baby-on-the-way is the way to accomplish normalcy). Told in alternating points of view, this novel shows you that sometimes love means making the choice to do what’s best for someone else instead being selfish and choosing what’s best for you. We all have problems we must face throughout life (some people have problems that prove more difficult than others, but sometimes that’s just the hand that life deals out). This story helped me to remember that sometimes it’s hard to not get so wrapped up in your own head and problems and that unwittingly this can often blind you to the point that you don’t even realize how selfish you are being. I give this surprisingly insightful tale five out of five stars. I will definitely be reading more of Katie McGarry’s books.